If you are looking for an exciting fantasy card game to play with your friends, you have come to the right place! In Warlord: Saga of the Storm 4th edition you play a custom-built deck around your Warlord. In the beginning of the game, it is the strongest character in your army - but beware! Should you lose him or her, you have lost the game. Devising strategies that uses your Warlord's abilities best and quickly and efficiently executing your plans is at the heart of the Warlord card game. But remember: No plan survives contact with the enemy! 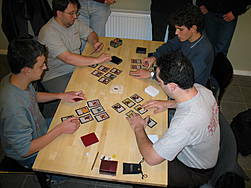 Warlord plays equally well in a duel format as in several available multiplayer formats (like 2 vs 2 or Battle Royale). Meet the community, get tips, discuss strategies and find events in our forum.